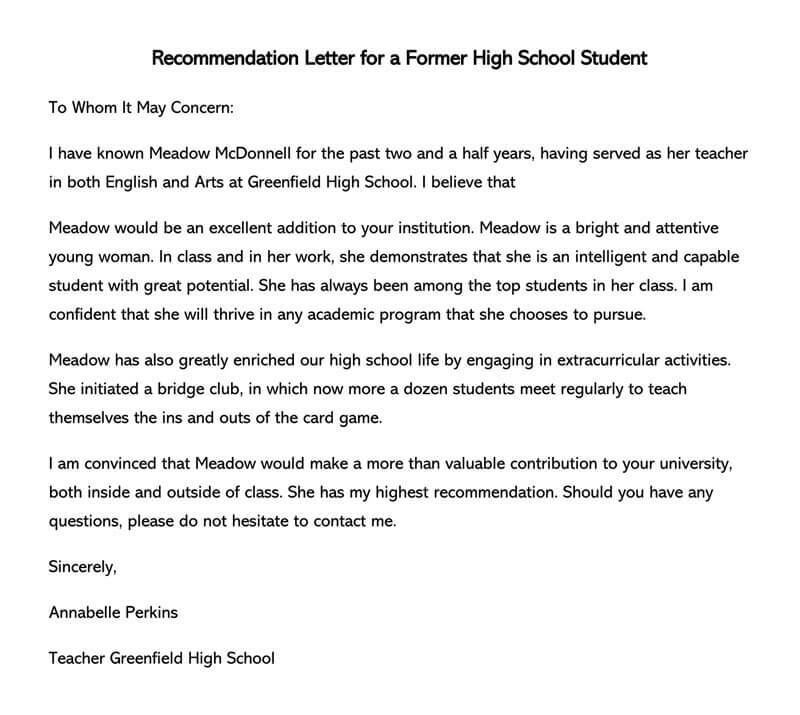 The right letter of recommendation written by the right person can move mountains and make a student stand out from the competition. This can often be the edge that a student needs to get into his or her school or program of choice. 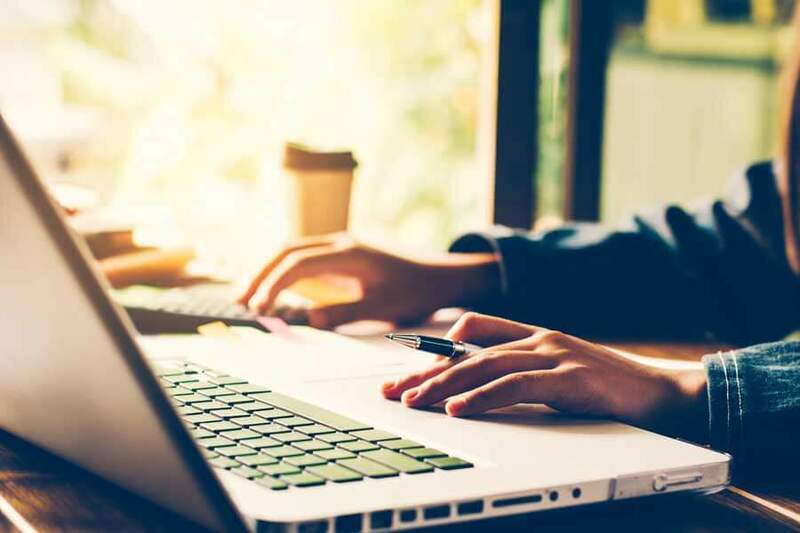 However, there are several guidelines that any instructor, teacher, or person of interest should take into consideration when it comes to crafting an effective letter of recommendation. One of the most important steps in this process is determining who should do the letter writing. 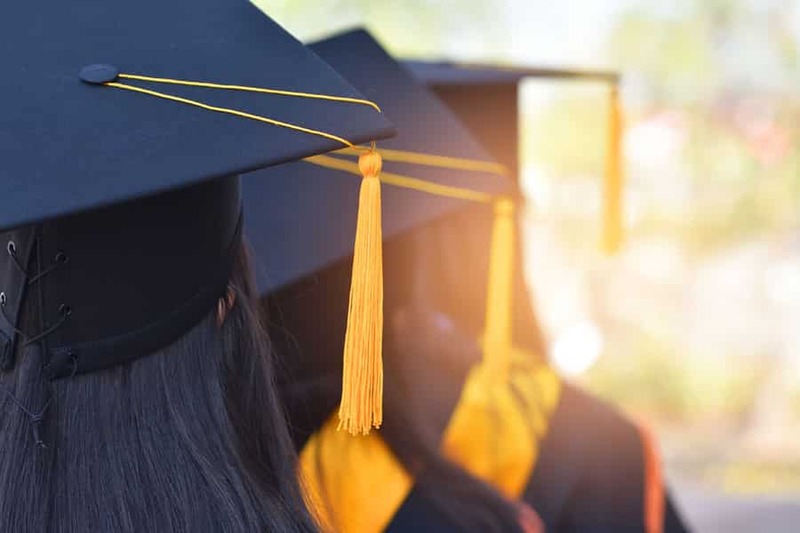 Although it’s a good idea to have a comprehensive list of a student’s accomplishments, both academic and extracurricular, it’s not quite enough. 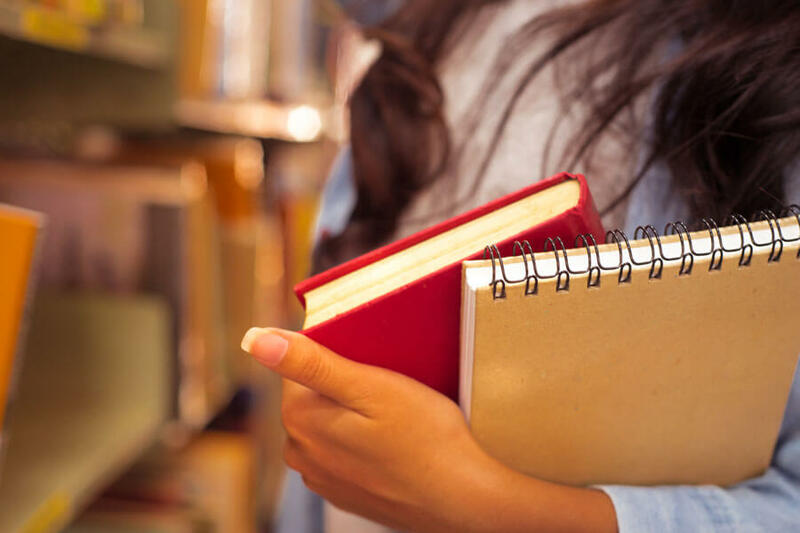 The most effective letters or written by teachers or instructors that know the student fairly well and have the ability to provide more personal insight into the student’s personality as well as his or her accomplishments. 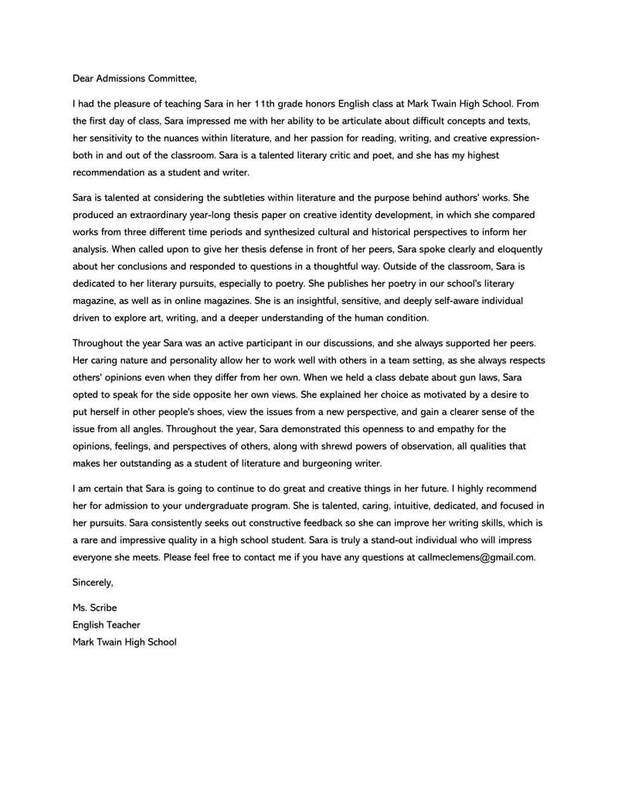 It’s a good idea to look at a letter of recommendation as a way of creating a three-dimensional impression of a student on paper or digitally. This can’t be done effectively unless you know a student fairly well. 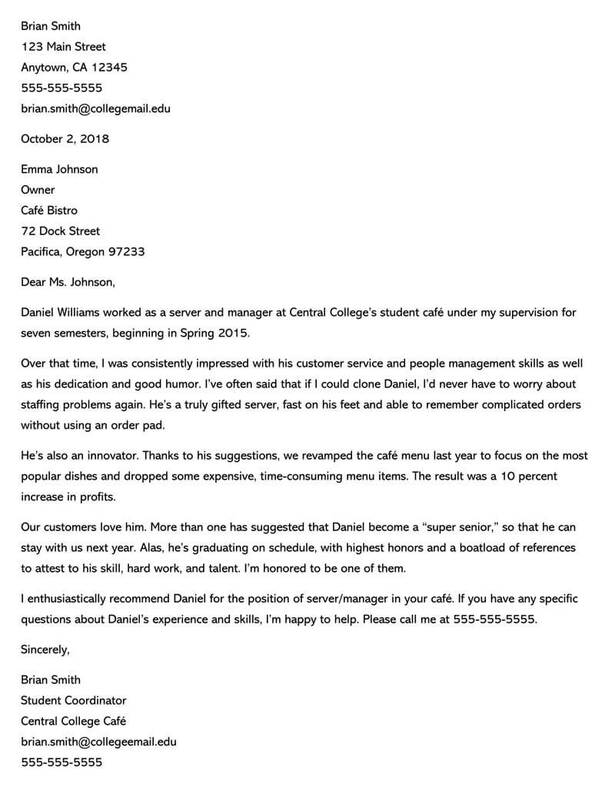 Before you actually draft your letter, look over sample letters to get an idea of what needs to be included and how the letter should be formatted. 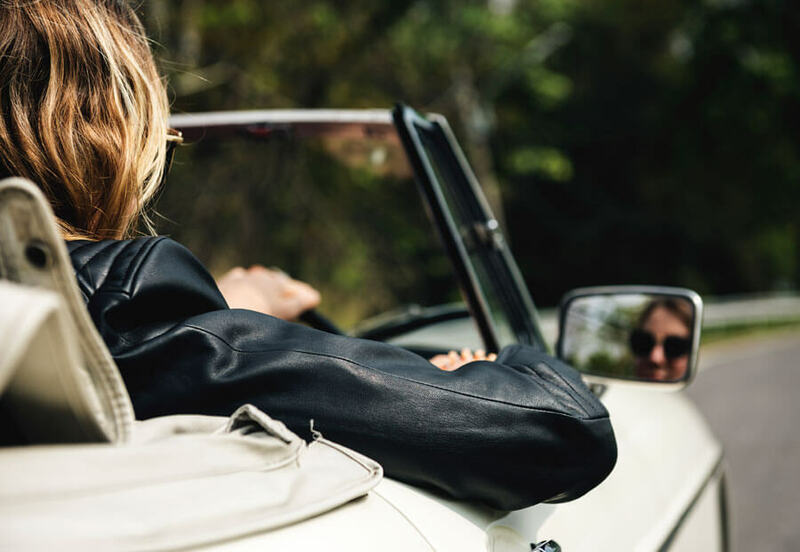 A sample letter is your roadmap and tells you how to conclude, what contact information to use, as well as where certain information should be placed. Charles Parker was a student in both my second and first-year literature courses. His grades and commitment to understanding the material led me to employ him as my teaching assistant during his junior year. 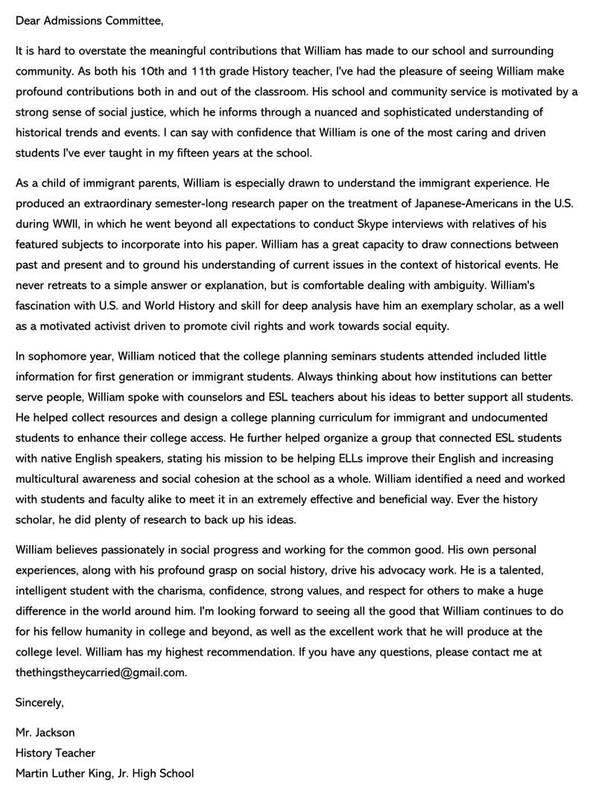 He helped other students understand a lot of the more complicated assignments that were part of my standard curriculum. He maintained a 3.8 GPA as well as his TA duties during his junior year which showed how responsible and committed he truly is. 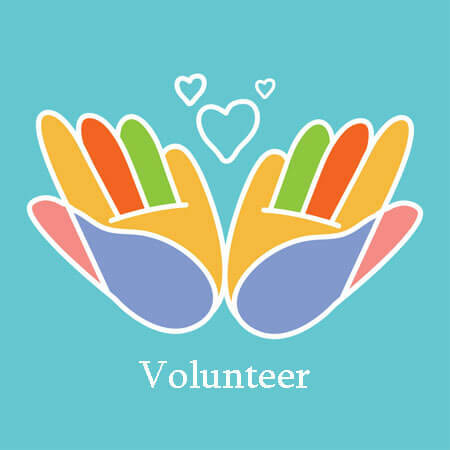 Charles has also been a longtime volunteer with the Big Brothers and Sisters organization. He has helped troubled youth make positive changes by setting a positive example and sticking with the BB&S program. He’s committed to his studies and his service to others has shown how responsible and capable he is. Charles would be an excellent choice for the business program at your university. He understands people and has a strong work ethic as well. He is not only a scholar but a person of integrity and strength. Don’t hesitate to contact me at amanda.jones@universitymail.edu or 222-222-5555 if you have any questions I could answer for you. I had the pleasure of working with Timothy Henderson while he was a tutor at the college library. His patience and commitment to helping underclassmen understand complicated math concepts was admirable. Regardless of how long it took, he’d work with students until he finally saw a light go on and they understood the concept. He was responsible for and committed to sharing his knowledge with others. He maintained a 3.9 GPA in addition to working almost 25 hours a week at the tutoring lab. In addition to his commitment to work and his academics, he also volunteered at the local area food bank and often helped with food delivery. Timothy really cares about people and this characteristic shines through in everything he does for others. His attitude and patience are remarkable. Timothy Henderson would be an excellent candidate for your internship because of all his stellar qualities. He’s a hard worker that always puts his best foot forward. As a result, I feel that your internship would be an excellent fit for a student with his qualities. ronaldparks@university.edu or 333-333-3333. I’d be happy to provide additional information if you need it. 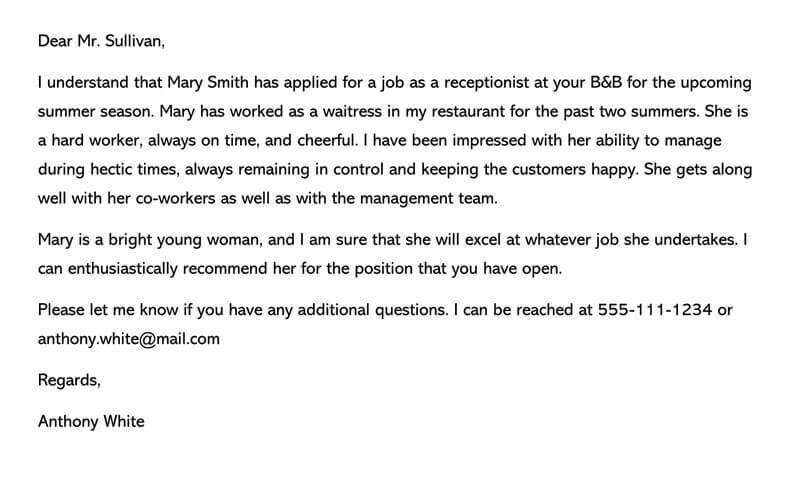 A strong letter of recommendation should always start with a formal salutation. This means that it should be addressed using professional sounding phrasing. 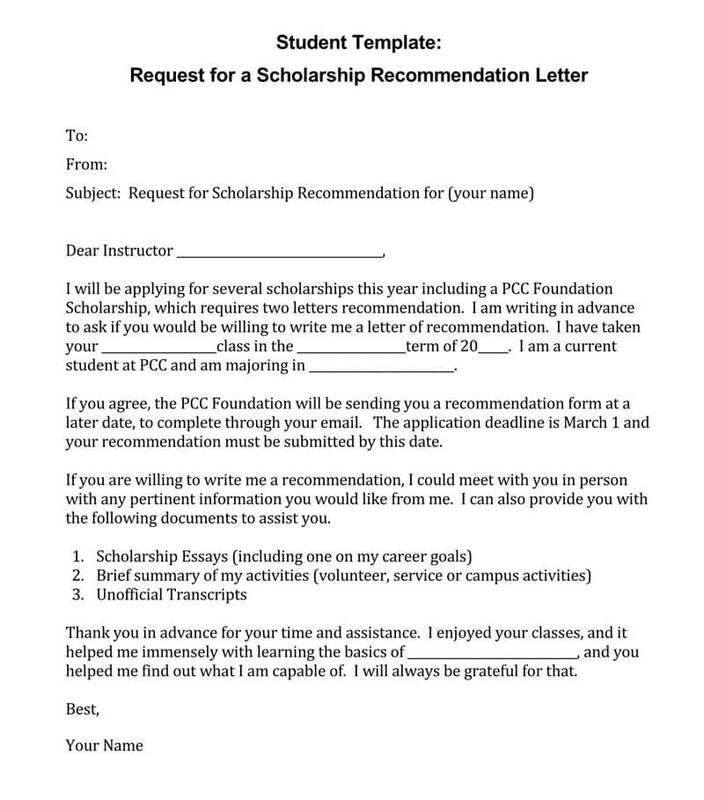 “To whom it may concern,” or “Dear Admissions Representative,” are good examples. You should also utilize a colon instead of a comma. 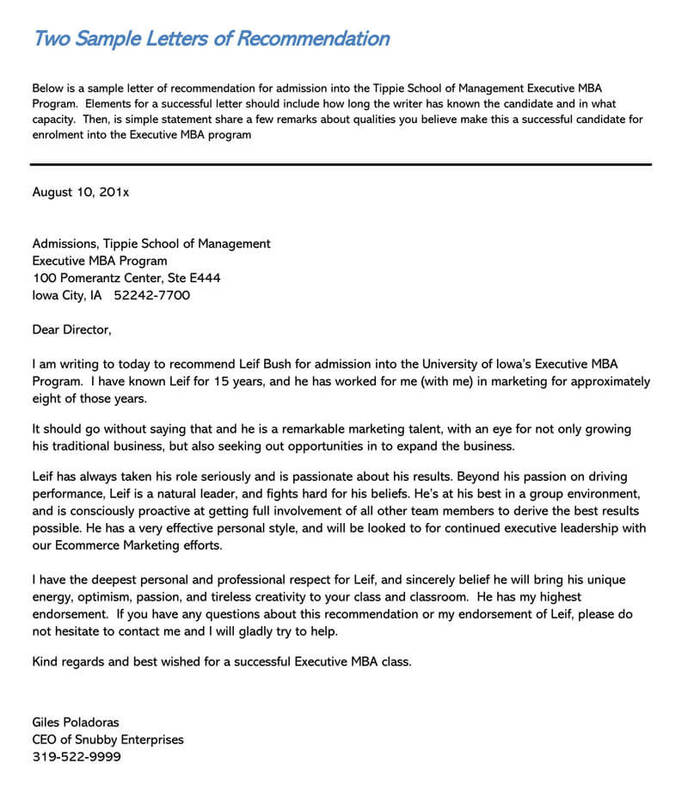 A letter of recommendation is, in essence, a business letter and should be written using a business format. 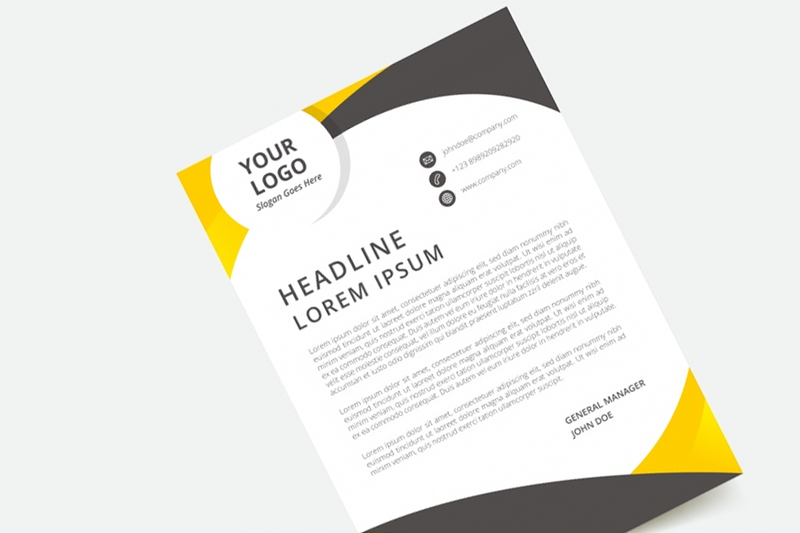 You should also use your school or company letterhead. The content of the letter should begin with an entertaining or memorable story about the student that showcases his or her talents. Keep in mind that the person reading this letter will read many. This is why your letter should stand out as much as possible by highlighting the student’s strengths in a strong and/or entertaining manner. Refer to the student by his or her full name when you initially introduce the student. 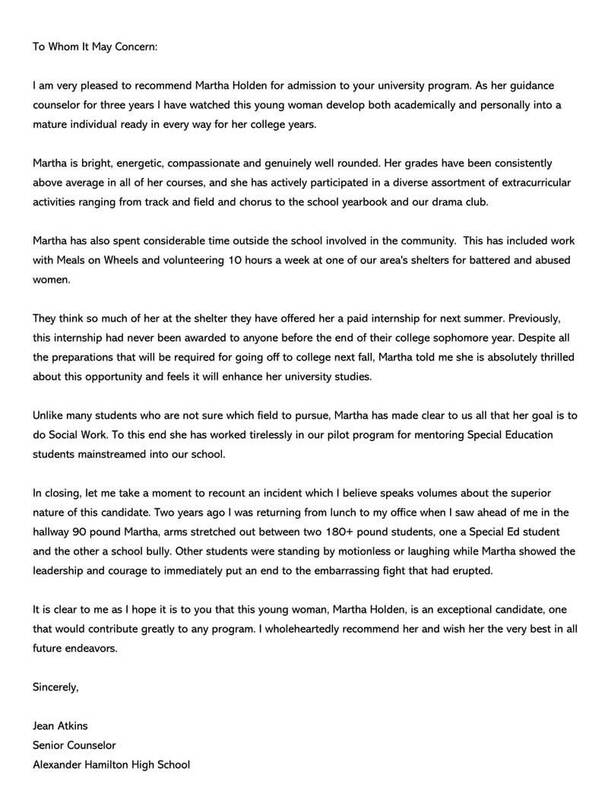 Throughout the rest of the letter, you can simply use the students first name. The illustrations you use to introduce the student should not only paint a picture of who the student is but also how they are perceived by others. 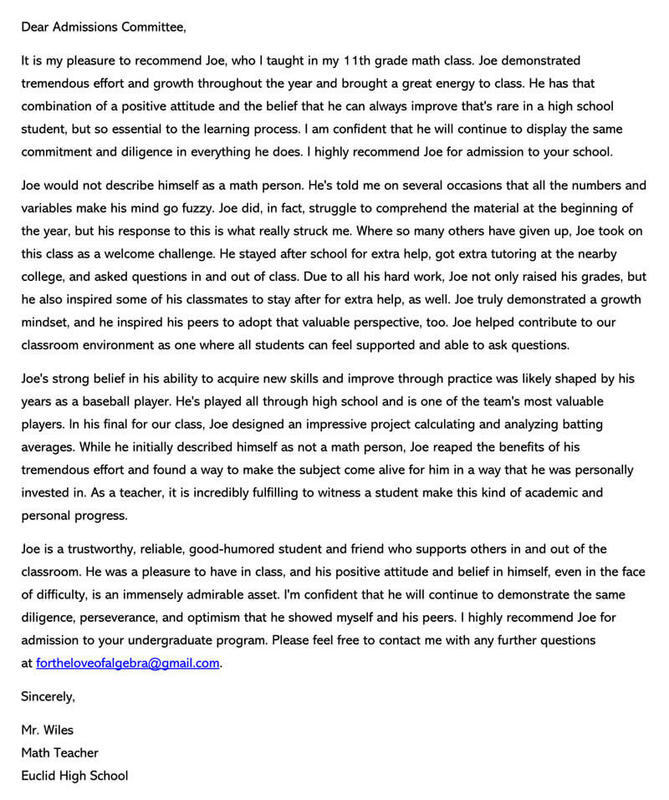 You can close the first paragraph with impact by summing up who the student is in a single sentence that highlights the students strongest characteristics. The second and third paragraphs should be character driven. 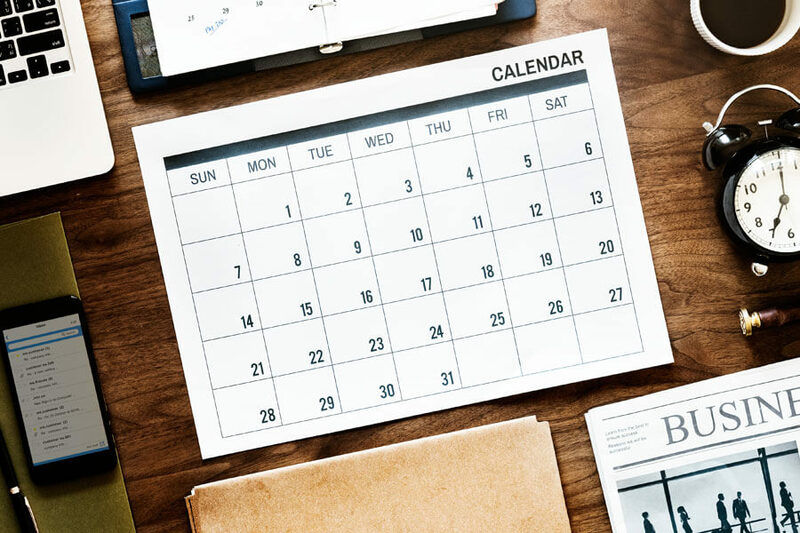 Any admissions counselor can find plenty of information regarding a student’s extracurricular activities and academic standing. 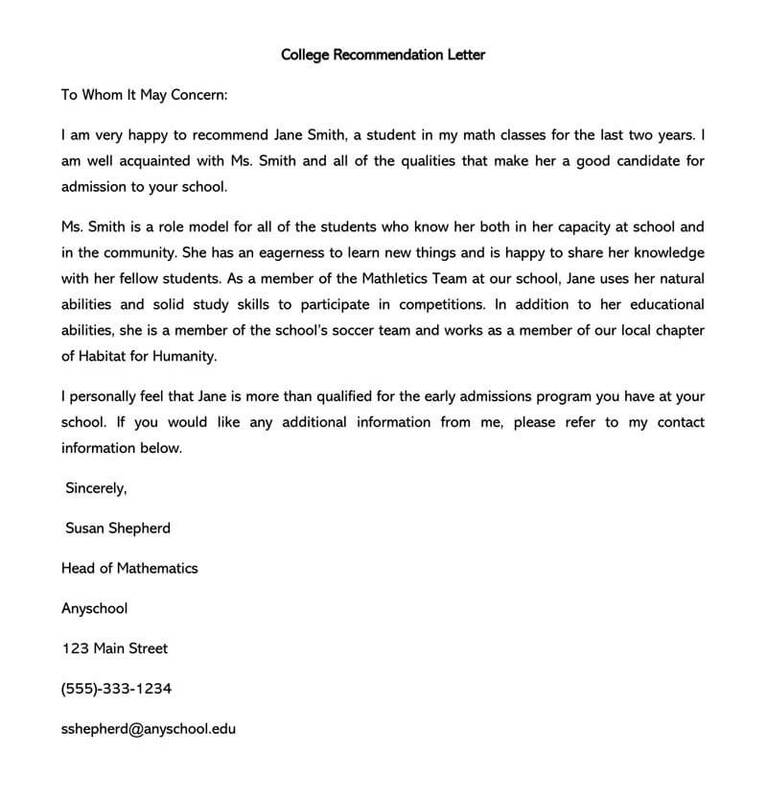 A strong letter of recommendation puts the flesh on the bones and gives an admissions representative an idea of who the student is based on personality and character. An admissions counselor is looking for information that will provide insight into how a student will fit into their school’s environment. This can be done in a variety of different ways. You can discuss a students commitment to getting a job done or the fact that a student has overcome obstacles by not giving up. There are many different approaches that you can take to illustrate character and personality. 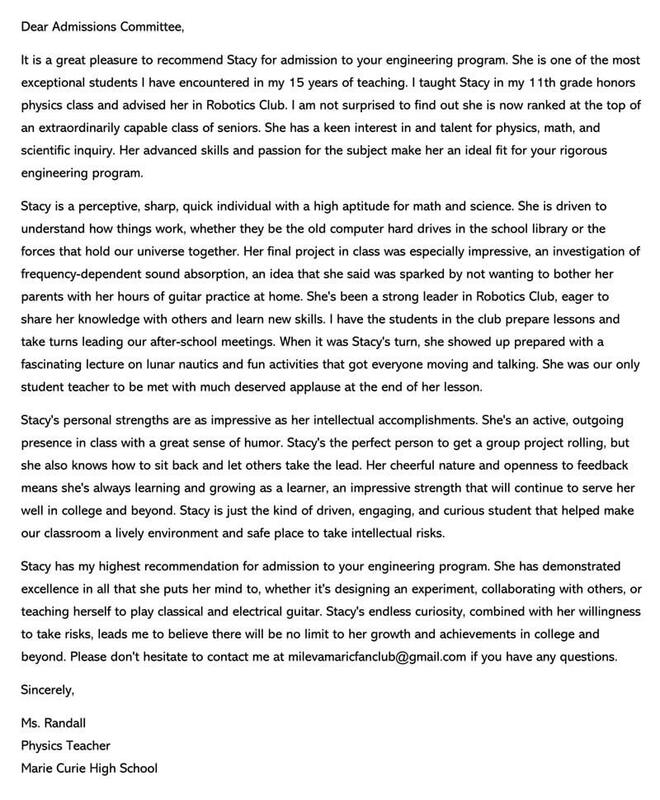 The concluding paragraph should close by directly recommending the student for the school or program in question. It should be sincere and direct and sum up why the student is a good fit. The last paragraph should also refer to the student by their full name. 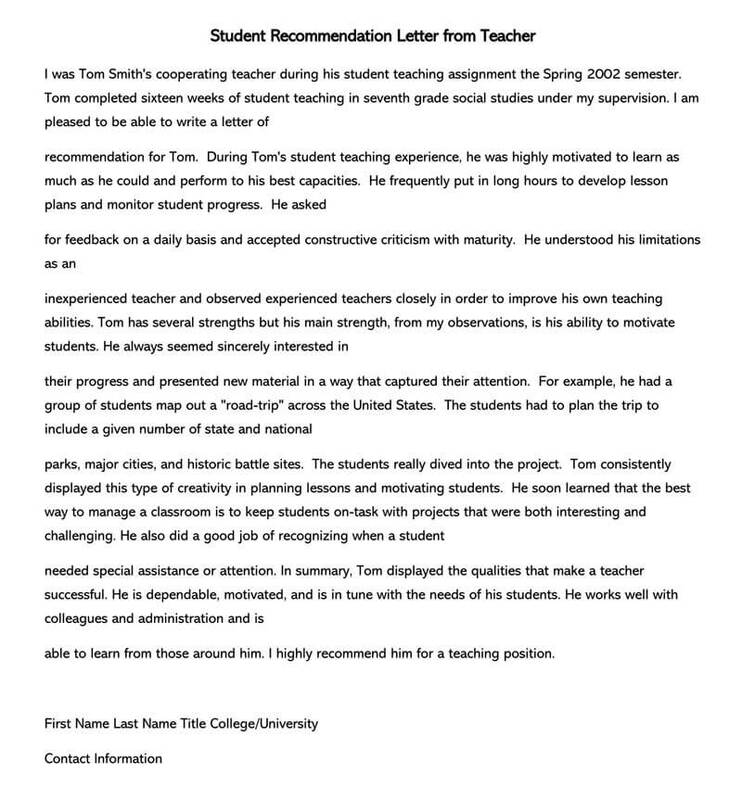 Keep in mind that a letter of recommendation is a strategic snapshot of a student that must be accomplished in a succinct manner. 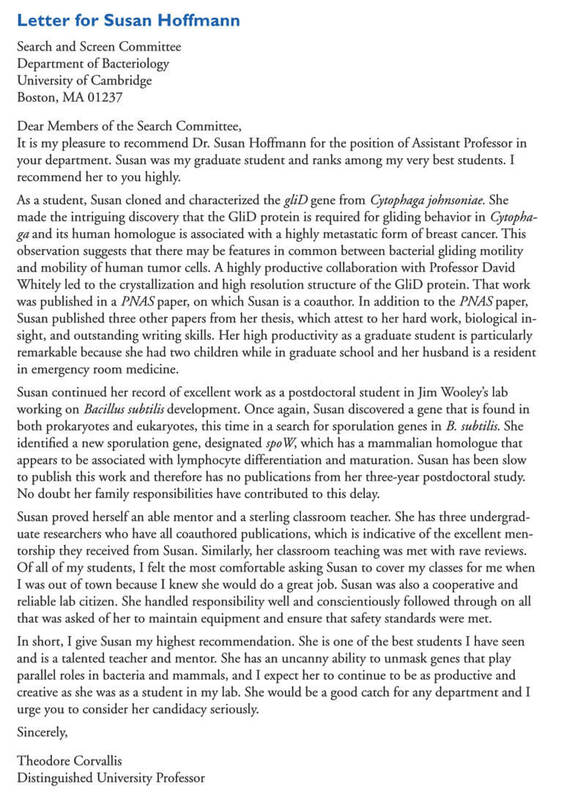 A letter of recommendation should be less than a full page of single-spaced text in Times New Roman 12-point. If the letter is submitted electronically, use the Arial 11-point font. A letter that’s too long may become boring or come across as insincere. 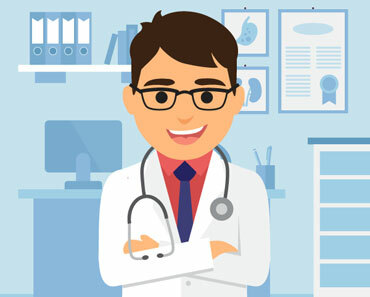 Close your letter professionally and invite the representative to call if they have more questions.